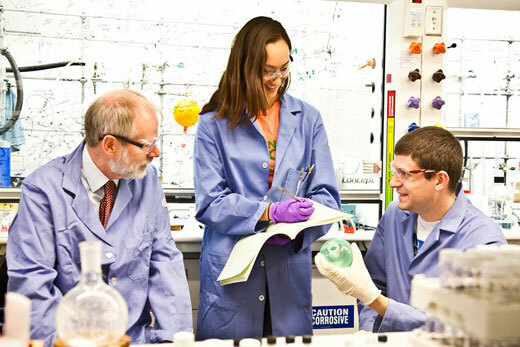 Chemistry professor Huw Davies, recent Emory College graduate Carolyn Cohen and graduate student David Guptill work in the lab. The Howard Hughes Medical Institute (HHMI) has awarded Emory University a $1.2 million grant to re-envision the chemistry curriculum at Emory College of Arts and Sciences and Emory's Oxford College. The award marks the seventh HHMI grant for Emory, says Pat Marsteller, director of the Emory College Center for Science Education. "We have leveraged previous HHMI support with more than $17 million in external grants and approximately $7 million in institutional support." Dean of Emory College Robin Forman notes that "HHMI's continued support for Emory's science education initiatives for the past 25 years has been a catalyst for progressive and lasting change in undergraduate science education. This new award represents a strong statement of HHMI's confidence that Emory will continue to play a leading role in reimaging what is possible in an undergraduate science curriculum, at a time of exciting exploration and innovation in higher education." Encourage students to enter science through various pathways and to succeed in science, technology, engineering and math (STEM) disciplines. "This HHMI award represents a marvelous opportunity for the sciences at Emory as our new science commons takes shape," says David Lynn, chair of Emory's chemistry department, referring to an ongoing expansion and renovation of the University’s Sanford S. Atwood Chemistry Center. The major building project is changing the boxed-in labs and lecture halls of chemistry’s past into communal spaces that bridge research and education. Construction also is underway on a new science building at Emory’s Oxford College, which similarly aims to promote research collaboration and a variety of engaged learning activities. "HHMI recognized an opportunity to uniquely integrate research and teaching within an exceptional science community, and this funding will help make that possible," Lynn says. The grant will support major changes in the way chemistry is taught, Marsteller says, noting that more than 700 students take introductory chemistry courses each year at Emory and Oxford colleges. "Chemistry is central to the biological and biomedical sciences and often has been viewed as a gatekeeper for these pathways," Marsteller says. "The plan we envision will enhance persistence and success in chemistry for all STEM majors." The plan includes five new introductory courses that will engage students with current research and active learning about real-world problems. The goal is to build a robust pipeline from discovery-based learning to doing hands-on science in faculty labs. "The re-envisioned introductory courses funded by the HHMI grant will lead into redesigned upper-division courses as well," says Douglas Mulford, senior lecturer of chemistry and the director of undergraduate studies for Emory's chemistry department. "Our transformation is happening at all levels of our curriculum, something that most other schools have not done, and that makes us unique in our efforts." HHMI investments have helped substantially raise student persistence and success in science from the early 1990s to today, especially for underrepresented minority and women students, Marsteller says. "Scientific research is increasingly interdisciplinary in nature, involving communication and teamwork between individual researchers with expertise in diverse fields," Marsteller says. "In contrast, undergraduate coursework in the sciences is often fragmented and unconnected. By building a community of faculty leaders steeped in evidence-based practices and committed to conducting innovative experiments in education, we plan to continue to catalyze positive change."